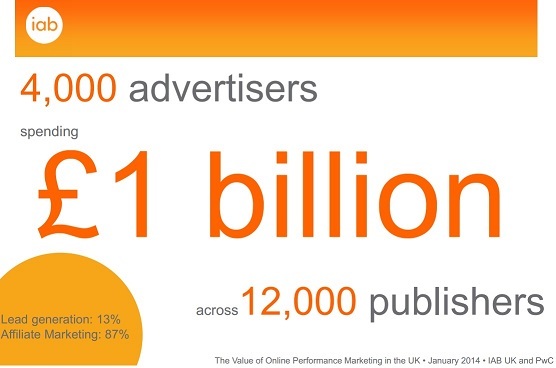 Following the brilliant inaugural study last year, the IAB has updated its Value of Online Performance Marketing with 2013 data. Carried out by PwC, this research is important validation about the true value and activities of this growing sector of digital marketing. Affiliate marketing and lead generation combined were found to command £1 billion of spend in the UK in 2013, up 15% on the previous year, while for every pound spent on lead generation, £7.69 is now driven back into the UK economy. IAB OPM 2014 Headline ResultsThis year the IAB has also included a really fascinating piece of consumer research about how the general public interact with performance marketing techniques. If any of you still need proof of just how mainstream lead generation and affiliate marketing have become, how comfortable consumers are with performance marketing - and how valuable it is for brand discovery, customer generation and even repeat purchase, you need to read the report! We will be diving deeper into the figures over the next week to assess the particular impact, potential and promise of lead generation within the online performance marketing mix so keep an eye out on our blog for more information and insights. In the meantime, click over to the IAB website to find out more or get in touch with us to find out how we can help your performance marketing programmes really deliver.